Welcome back everyone and another Happy New Year to all! I am writing this on my Birthday which has been filled with good food and great TV as I am catching up on The Magicians season 3…my wife and I absolutely love this show! My kiddo is a very lucky boy as he is off watching the Gasparilla kids parade with the grandparents while we stayed home due to me hurting my arm last week, which is a total bummer but I’m having a good Birthday despite the pain I have been in for a week! So this comic review is brought to you by our great friends at Bearded Brown Coat Comics and Games in Ocala. You really should stop by and give them a look if you are ever in town. Unfortunately, they had to close down their Gainesville shop but that means everything has come down to Ocala making this new bigger store that they moved into basically a superstore for comics and games! They are certainly worth a look! You can check out their facebook by clicking the banner below as they are always having some awesome gaming events! So our second comic review from Bearded is the new Invaders #1 from Marvel. For those that don’t know your comic history Marvel started out way back when with the Super Heroes by putting together Captain America, Namor, Bucky Barnes and the original Human Torch (yeah Johnny Storm isn’t the original the original was an android) and these guys were known as the Invaders and their mission was to stop the Nazi’s in World War II. This new comic is bringing the old band together again in a way which has been very interesting for the first comic. See Namor seems to be the focus as in the present day he is building an Army from the Atlanteans and it sounds like he is planning on invading the surface world. From the bits and pieces you get, it sounds like his plan is to end all war by basically destroying all the humans thus no humans no war or at least that’s what it has been seeming like to me. Now Jim (The Human Torch’s real name) is writing a book about the times of the Invaders and he is worried about Namor. After all, Namor seems to have had it rough during the Invaders days losing some humans he actually cared about but not wanting to admit it and such. Then of course after that, there was the span of years Namor traveled the world with amnesia as a homeless man and then everything else leading up to this time. We learn some about how he dealt with the loss of friends in the war in flashbacks. Now Jim is afraid that Namor might be going a touch insane which kinda seems to be what’s going on when you see the parts with Namor and as such he thinks it best if Namor’s original human friends the Invaders were to get the band back together one more time and try to help Namor as they are afraid that if Avengers or X-Men and such show up that it would just result in huge battles due to misunderstandings and such…..I have to agree with that assessment if past comics hold true with such courses of action. I really enjoyed this comic and highly recommend it to any fans of the Invaders or their members. So be sure to check it out it was good! Also be sure to check out our other blogs coming soon, we are also hopefully getting a new writer coming in soon with a lot more content coming! If you would like to support us and help us do what we ar doing, be sure to check out our merch once we get our store up or if you just want to help by dropping us a donation just stop by Ko-fi.com/thalra. Another interesting twist had Jim finding a picture of Namor and Charles Xavier together that seemed to be taken during the time that Namor had lost his memory. This makes me wonder if Charles Xavier had something to do with the Amnesia, which wouldn’t surprise me since Xavier is Marvel’s fall back to any problem it seems at times. I was interested in this, but I didn’t know it was going to be this good. 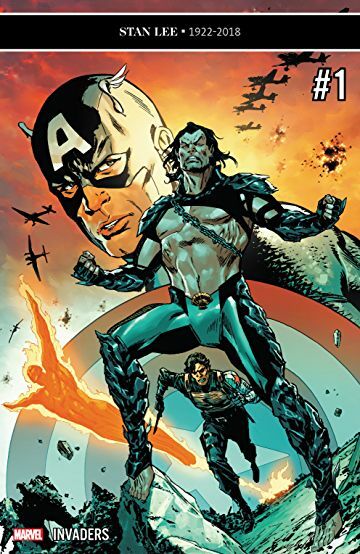 Also, I always wondered what Namor did for all those years between the end of WWII, when he became an amnesiac, and when Johnny Storm helped him regain his identity. I assumed this was well-trodden ground in comics I hadn’t read, but it seems to be All-New. Excited to learn alongside everyone else :)? OMG I hadn’t even considered what you said. What if Xavier was the cause of Namor’s amnesia? Wooow.? Namor having water powers is awesome, but I agree it should go away by the end of this story. I imagine that, whatever he did to get those powers, it’ll backfire on him.? This was a GREAT comic. I reckon series of the year, if this first issue is any indication. ?